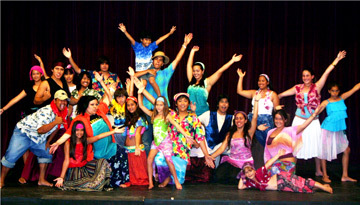 The Performing Arts Center of Kapolei presents "Once on This Island" for three final performances, at 7 p.m. Friday and Saturday, and 3 p.m. Sunday at Kapolei High School. The play, directed by Meagan Olson with vocal direction by Kala'i Stern and choreography by Danielle Yamamoto, is based on a novel from Trinidad with themes of love and forgiveness. Tickets are $5 presale; $7 at the door. Call 258-7313. The Canvas & Clay Channel, on digital cable Channel 320, debuts tomorrow with statewide programming devoted to the islands' artists. Paradise Television Network on Maui is operating the new 24-hour channel. Canvas & Clay will be associated with the Web site www.canvasandclay.com. Get back to basics with the local delegation of the Slow Food movement, created in Italy to combat the world's gravitation toward the meal-in-a-bag culture. The group's next event will feature a six-course tomato-themed dinner following a cocktail and pupu reception, on Sept. 10 at Town restaurant in Kaimuki. A "Tom and Cherry" salad with fresh mozzarella and organic basil will be accompanied by a variety of dishes, including risotto, Tomato-Dusted Kahuku Shrimp and Chicken Thighs al Mattone. Cost is $100; $95 for Slow Food members, including two bottles of wine per four-person table. Call 735-5900. Stop overeating and relying on comfort foods, and learn to manage your stress more effectively at "Eat, Drink and Be Merry," with dietitian Catherine Conway, at the September meeting of the Vegetarian Society of Hawaii, 7 p.m. Sept. 12 at Cameron Center Auditorium, 95 Mahalani St., Wailuku, Maui. Kapiolani Community College's Cooking for Health and Wellness Series continues in September with Macro Fast Food II. Learn to prepare meals using whole grains, vegetables, beans, fruit and natural sweeteners, 1 to 5 p.m. Sept. 16. Cost is $45. Call 734-9469. 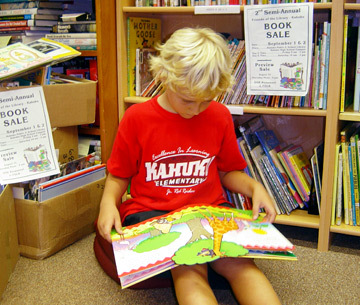 Six-year-old Tom Woodard samples the books to be sold at the Kahuku Public Library's book sale, 9 a.m. to 5 p.m. Friday and 10 a.m. to 3 p.m. Saturday. Hardback and paperback books, as well as CDs and DVDs, will be sold, with proceeds to support library programs, book purchases and other needs. Next week the library is also sponsoring showings of the films "Fantasia," at 6 p.m. Tuesday, and "Whale Rider," at 1:30 p.m. next Wednesday, as part of the After School Club. Reservations requested; call 293-8935.